I first heard about Forum Theatre 5 yrs ago whilst taking part in a communications course organised jointly by St John’s Hospice (in North London) and Royal Central School of Speech and Drama which taught acting skills to improve communication for doctors. Forum Theatre was devised by a Brazilian called Augusto Boal in the 70’s1. Boal was a dramatist and political activist who had earlier been imprisoned and then exiled in Brazil due to his opposition to the military regime. He devised Forum Theatre , not as a form of entertainment , but to act as an instrument to provoke social change. Sometimes referred to as ‘ Theatre of the Oppressed’2 it was designed first and foremost by and for communities struggling with oppression. Following the discussion the scenes are played out again but the audience can ‘stop’ the action at any point and an audience member can replace the lead character and ‘try out’ their theory of how they could have behaved differently. The other cast members will stay in and respond in character. It is also worth noting that the characters which have been created have their own motivations and needs to get the original outcome and so will not ‘make it easy’ for change to happen . Forum Theatre is a form of ‘participatory arts’ and the audience is considered as much part of providing the drama as the cast. Boal referred to this as transforming spectators into ‘spect-actors’. Its job is not to teach a solution or show others how to do things but let the audience learn and work together to look for solutions. Forum Theatre is very powerful when performed by members of a community for the wider community and the scenes reflect issues that are perceived as oppressive or disempowering. Forum Theatre is more than just simple role play or using actors/drama to demonstrate certain situations. The audience are the ones moving the drama forward as they are encouraged to look for ways to change common unresolved situations from ‘what they are to what they could be’. It tries to create conditions in which groups or communities can shake of ‘the ideology of expertise’ to discover , develop and validate local knowledge. It provides the tools to observe, analyse and change ones reality and to understand the underlying power relations , mechanisms and root causes of disempowerment. It also provides the opportunity to observe and reflect upon everyday dilemmas and dynamics that are underlying these such as the motivations of others and the power dynamics that exist in all communities. By inviting the audience to take part in the drama they are able to have first-hand experience of the unexpected consequences of their actions .People often discover that certain things are not as easy as they thought. It is also an excellent opportunity to see how communication is not just words but is affected by many non-verbal issues such as tone , body language and the hidden intent. 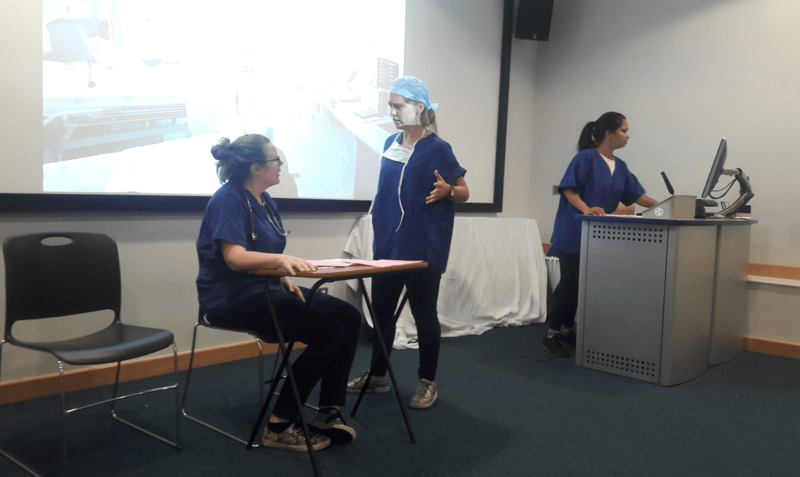 Following my first introduction to Forum Theatre via the communications course; we successfully introduced several projects to our Emergency Department. One of these was with Cardboard Citizens Forum Theatre Company and two were with masters students from Royal Central School of Speech and Drama (C.S.S.D). As part of their Masters course the students will do placements with a diverse range of groups also including schools and prisons. 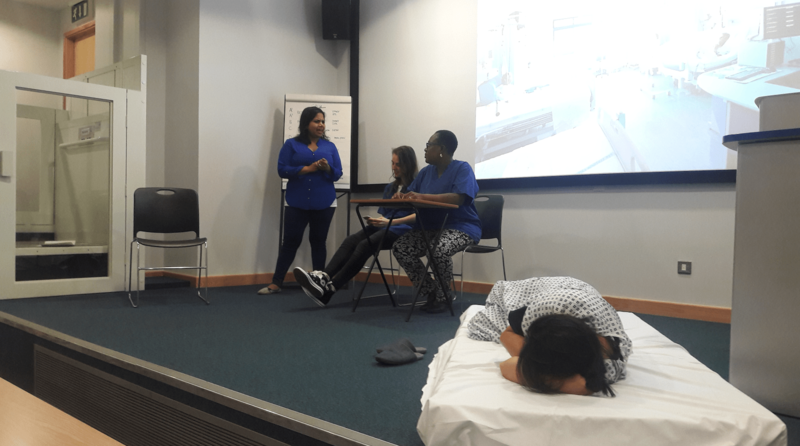 Initially we used the projects to focus on (poor) communication between staff and patients and based the scenes on patient complaints and used the performances to explore ways in which we could improve. However, like many people working in the current NHS and Emergency Medicine, I was becoming increasingly concerned and angered by the atmosphere and stress that all staff were having to work under and the effects that these were having. Following our departments experiences in the winter of 2016 I arranged a Schwartz Round3 for the ED staff entitled ‘The Winter of our Discontent’ and we heard story after story of the staff’s despair with certain situations which they now found themselves in. It occurred to me that Forum Theatre ,which is based upon communities experience of disempowerment , struggle and the desire for creative solutions, was an ideal medium to look at staff experience in a different and innovative way and search for ways to improve it. This year’s project was again run with Masters students from the Royal Central School of Speech and Drama. We organised four whole day workshops resulting in a piece which we performed on the evening of the last workshop. Nine staff members attended the workshops. As well as myself we had five members of the nursing team and three doctors. Prior to the start of the project I met with the course director – Selina Busby and then with the drama students – Nell and Elisabeth. I gave them a brief of what I felt were the issues and what I wanted explored through the pieces. 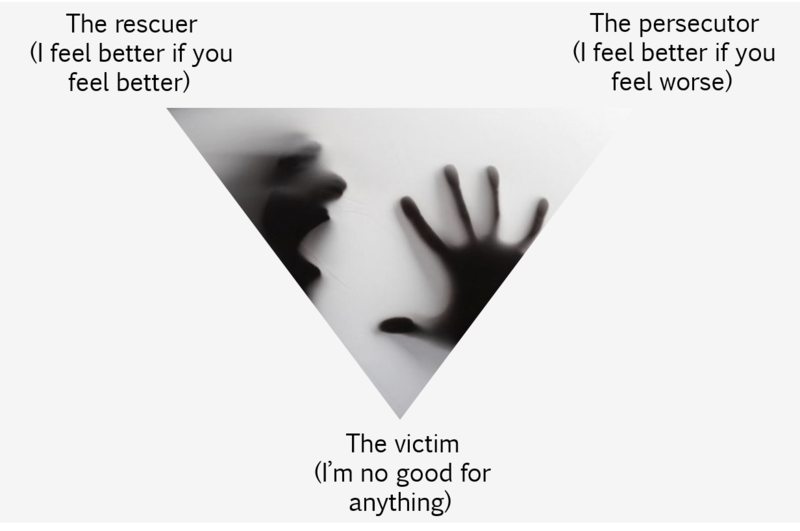 I was also influenced by the Karpman (Drama) triangle4 (Ed – which Stevan Bruijens blogged on the site about recently) which identifies that some people under stress will conform to being either victims, rescuers or persecutors. All of these are ultimately dysfunctional and form co-dependant relationships. The workshops are designed to do several things. The first is to integrate the group and to increase their expressive capacity. This is done through a variety of exercises and playing games. The games are variations of the types of games alot of us played as children at parties or as students in the pup as many of them are ideally suited to drinking games. People may find them trivial or childish but they are actually very sophisticated and work at a lot of different levels. In this and previous projects the staff involved have always fed back very positively about this and loved the games. They also say that the games have given them the opportunity to get to know each other and work together in a way that they have not previously done before. Based partly upon the success of the games in previous projects we have started a programme in the department where, once a week, we take all available staff of the shopfloor and spend 10 minutes doing a wellness activity. This is frequently playing games. At other times in the workshop the participants split into groups and discuss issues which left them frustrated, unhappy or powerless. We then took some of these ideas and developed them using improvisation exercises to two scenes which were to become our final performance. The staff taking part were not told by either myself or the drama students what to do and so the scenes developed out of what they found annoying or frustrating. Or to quote one of the doctors who watched the performance ‘ the sort of things that just make you want to cry’. Interestingly, but not surprisingly, both scenes were related to situations where staff felt they struggled to do what they considered a good job whilst trying to maintain targets. This was also something that was highlighted in our staff survey. They also illustrated the way in which, in a highly stressful environment, individuals often communicate with each other. However one of the exercises in the workshop was based on developing all the characters and giving them a back story with worries, needs and desires (just as in life) which the audience doesn’t see but, in part, drives their responses and motivations. The final performance was attended by other staff members from the ED and also others from the hospital. The audience included our Chief Executive, Medical director and Chief Operating Officer. During the discussion the audience did identify and empathise /sympathise with the ED staff member who was left feeling ‘that they wanted to cry’. One audience member stated that she found one of the scenes almost too painful to watch as it highlighted a scenario where the ED nurse looked uncaring but actually wasn’t. However the audience also highlighted that in both scenes the staff members being ‘oppressed’ were , in some ways, contributing to this as they were behaving like ’victims’ and allowing others to control them and should be more assertive. Interestingly when the time came to replay one of the scenes ; it demonstrated that there is a fine line between assertion and aggression and that crossing it did not improve the situation but just encouraged the other cast members to become even more immovable and determined to be right and resist change. Ultimately the best outcome was achieved by a firm but measured approach that also suggested ways of working to reach a common need for all parties. The audience feedback for the performance was very positive. It was described as educational , challenging and provocative but also joyous and fun. The feedback from the staff members who took part in the whole project was also very encouraging. Prior to starting the project I asked them how much power and choice they believed they had. I asked them the same question at the end. In all cases they felt that they had realized that they had more than they first thought. They felt that doing the project had given them a different perspective on the way that they and others communicated. They also felt closer as a group and some reported feeling more confident. One of the nursing staff said that she often felt being a nurse ‘ diminished her’ but that this had given her a voice. The figures for both burnout and depression amongst the medical profession are high and emergency medicine is one of the specialties with the highest rate of burnout. We are all going to have to prioritise the wellness of our staff – physical and emotional and incorporate strategies to safeguard both. Hopefully staff wellness will soon be considered ,by all ,as important to clinical governance as eg patient safety. The learning from Forum Theatre should not end with the performance. 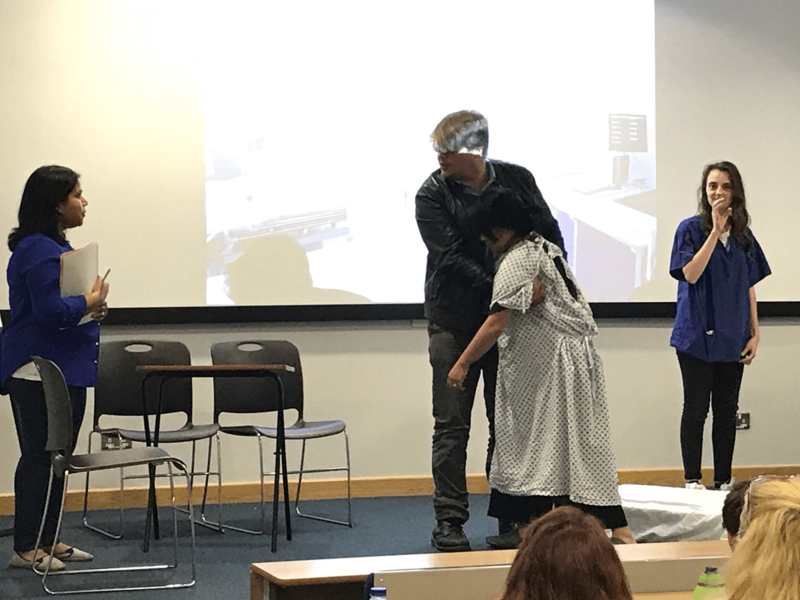 Just as we all use simulation teaching to prepare us for medical emergencies ; Forum Theatre can prepare us for life and it’s daily dramas and dilemmas because as we all know it is these that frequently are the things that ‘just make us want to cry’. 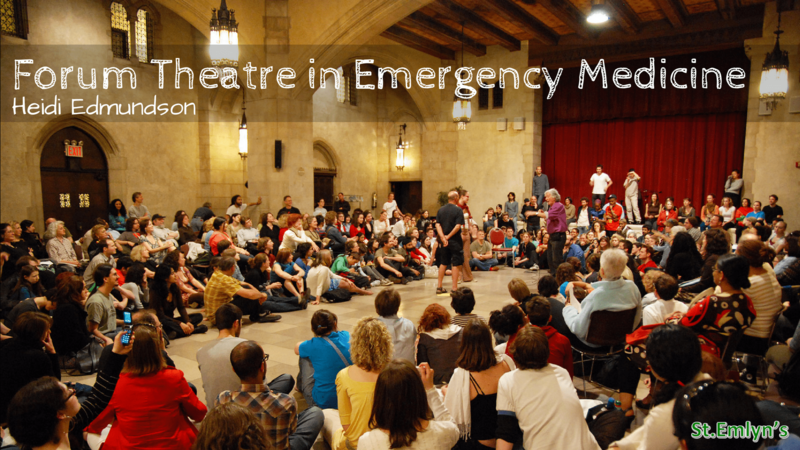 Forum Theatre has been an incredible journey for me, my colleagues and the wider department and I genuinely believe that it has helped us understand the complexities of communication, attitudes and relationships within the complex world of emergency medicine. If you want to know more then please contact me via twitter (or any other means). Forum Theatre. Wikipedia. https://en.wikipedia.org/wiki/Forum_theatre. Published 2018. Accessed June 21, 2018. Theatre of the Oppressed. Wikipedia. https://en.wikipedia.org/wiki/Theatre_of_the_Oppressed. Published 2018. Accessed June 21, 2018. Schwartz Rounds® | The Schwartz Center for Compassionate Healthcare. The Schwartz Center for Compassionate Healthcare. http://www.theschwartzcenter.org/supporting-caregivers/schwartz-center-rounds/. Published 2017. Accessed June 21, 2018. Bruijns S. Codependency and the Emergency Clinician. St Emlyn’s – St.Emlyn’s. St.Emlyn’s. http://www.stemlynsblog.org/codependency-and-the-emergency-clinician-st-emlyns/. Published May 9, 2018. Accessed June 21, 2018.